← Brunch In Harlem  サザン・コンフォート・フード@エイミー・ルースAmy Ruth’s Best Chicken & Waffles! NY’s best Chicken & Waffles! 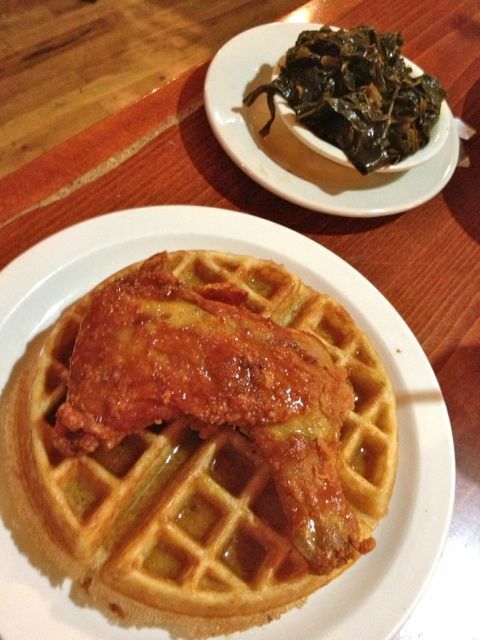 You should try Amy Ruth’s famous chicken and waffles (The Rev. Al Sharpton) for branch. It comes with a generous piece of really crispy and moist fried chicken and a big waffle. The chicken combined with the flavor of 100% pure maple syrup and waffles is heavenly. Who Invented Chicken & Waffles? This entry was posted in Brunch In Harlem, Harlem Wonderland, Restaurant and tagged Amy Ruth's, Brunch, chicken and waffles, Famous Chicken and Waffles, food, Harlem, harlem renaissance, late night food, restaurants, rev al sharpton, Southern Comfort Food, southern slaves, Wells Supper Club. Bookmark the permalink.